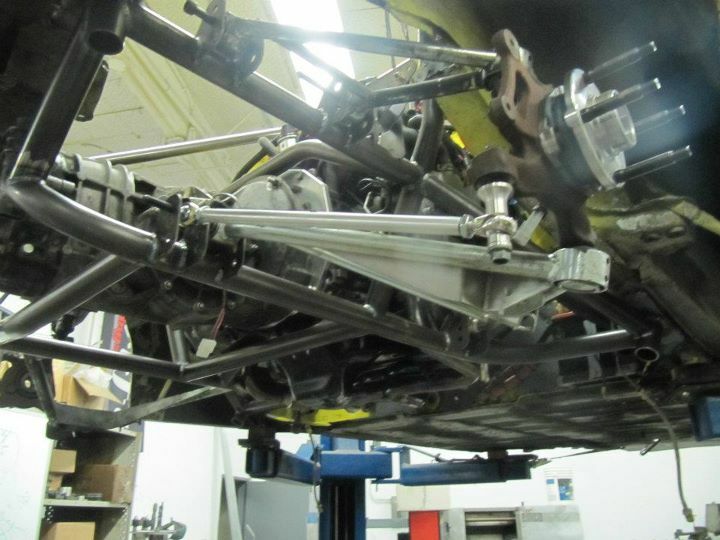 I love this shot...looks like the rear of a Porsche 908 with all the exposed suspension parts. 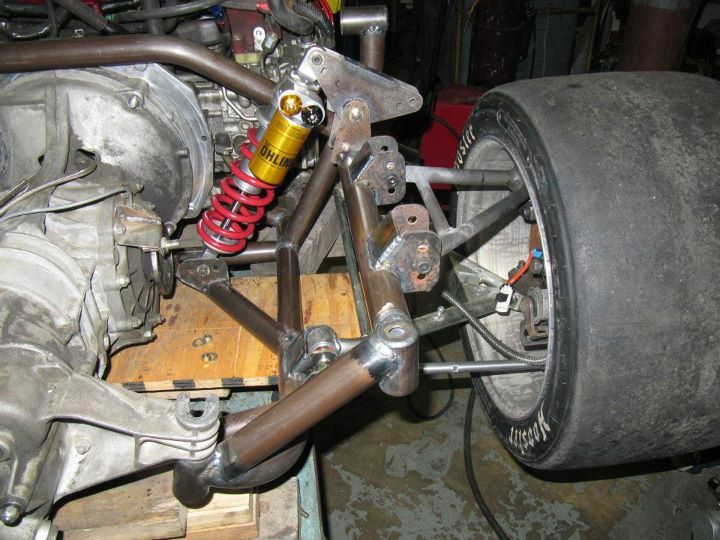 Both rear toe links completed and everything bolted up. Need to complete the shock mounts and this thing will be on the ground. 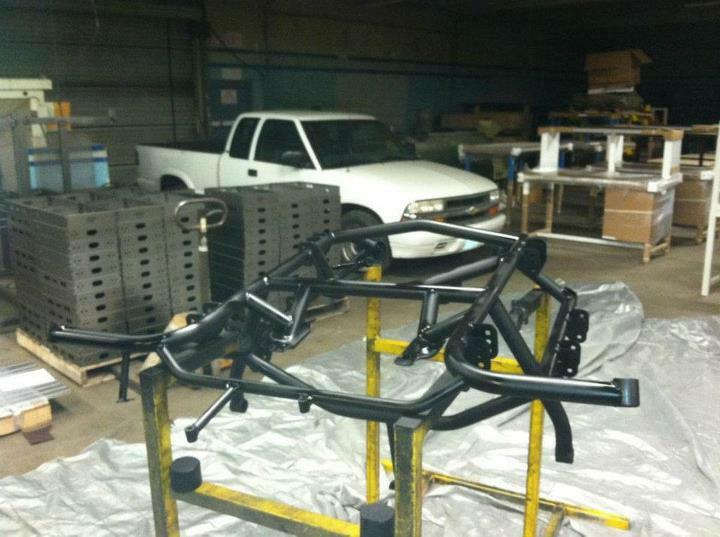 Lots and lots of work put into this rear sub-frame assembly. You can also see the new battery mount. Rear Bogart wheels mounted. These are 12" slicks on an 11.5" rim. These weigh in a 42lbs with tire. 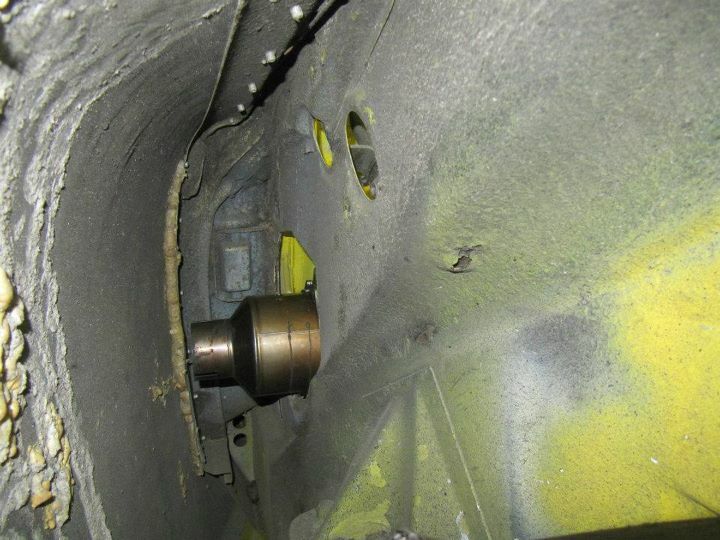 Inside of the rear wheels. Still need to get some custom axles made. 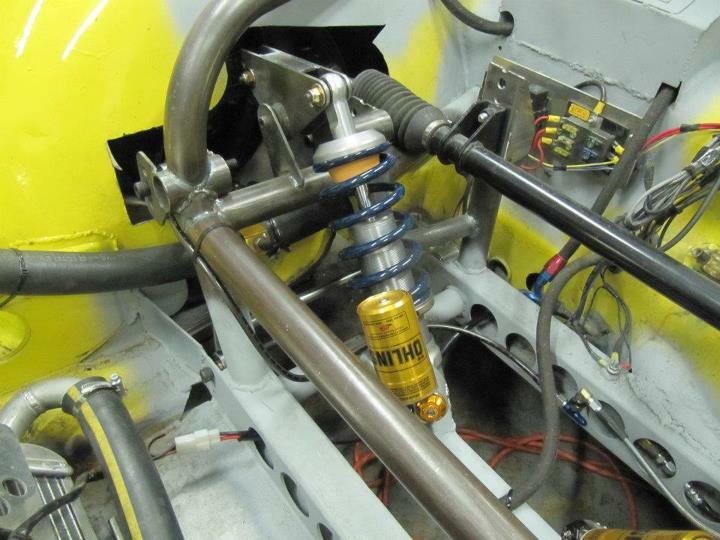 Approximate location for the rear shocks. Ran out of time to get them mounted so I will have to make another trip down to finish things up. 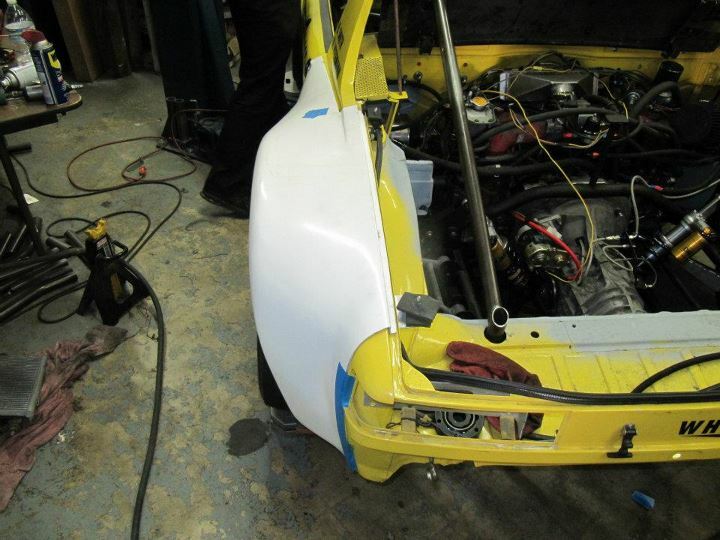 Good progress on the car this last weekend. 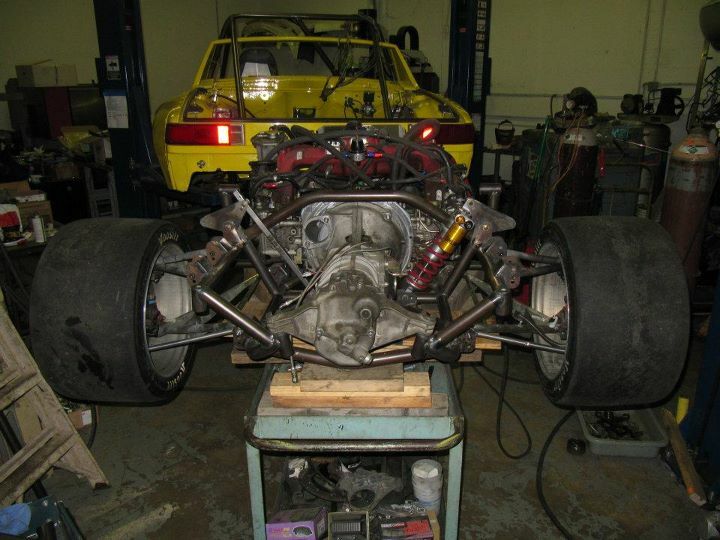 Got the rear suspension geometry all worked out and the shocks mounted, fuel tank enclosure done, most of the cage welded in and bolted up all the suspension components to the car and actually put the car on the ground. 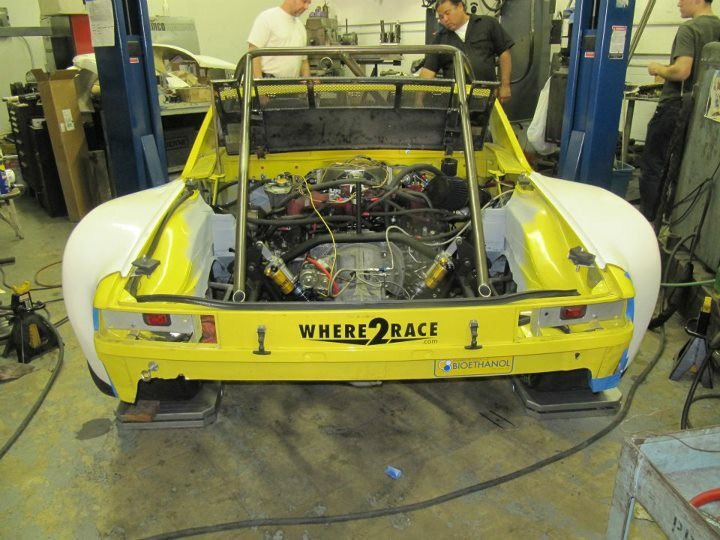 The goal is to get the car out for shake-down runs on my next trip down there. We shall see if that happens, still need to get a couple of custom components made and I am hoping everything fits. 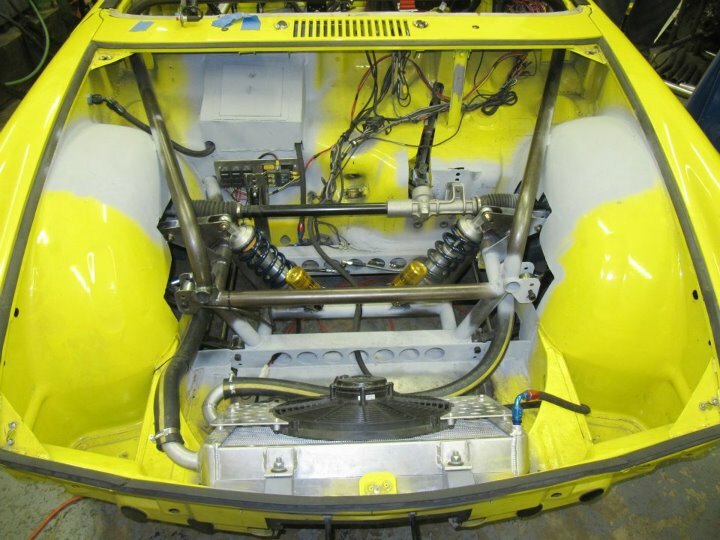 Here is the rear sub-frame completed with the rear shock mounts in place and the control arms all bolted on. Sitting on the bench, it looks awesome. 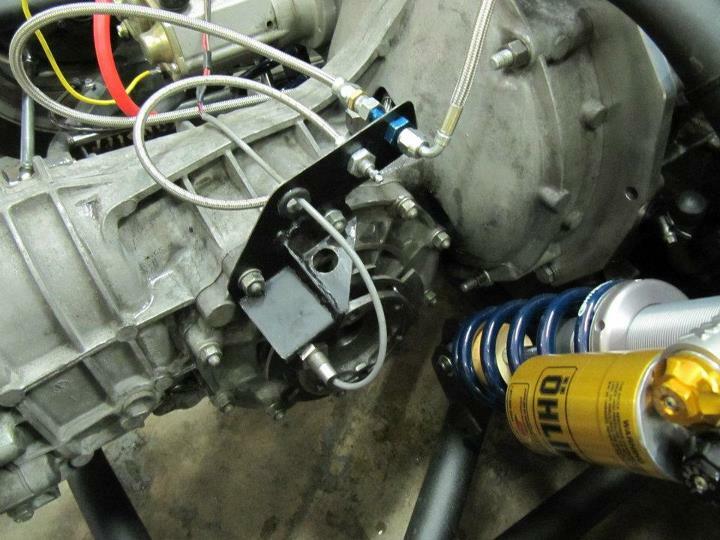 Rear rocker mount completed and shock in place. 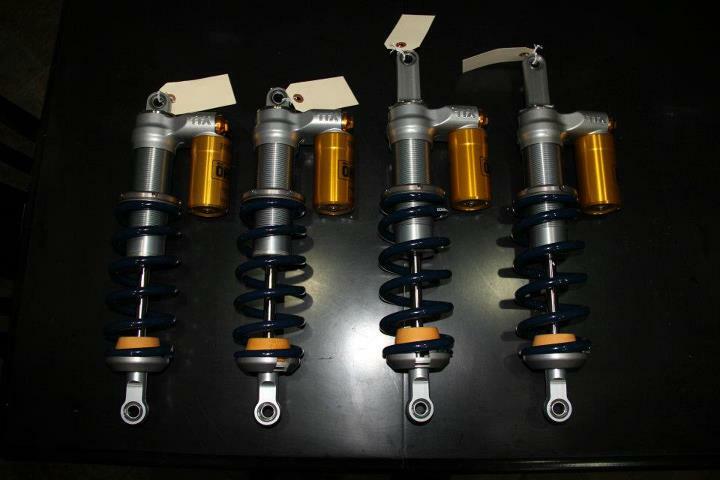 The final shock length will be longer for the correct motion ratios. Rear sub-frame going back into the car. We will put quick-disconnects on various lines to make the process a bit easier. 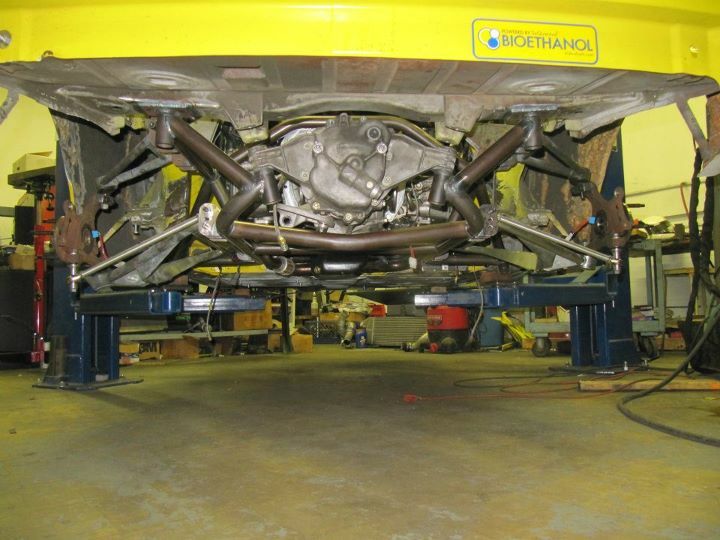 Rear sub-frame assembly from underneath. Two bars added to support the shock mounts. The assembly is very strong and comes in and out with ease. 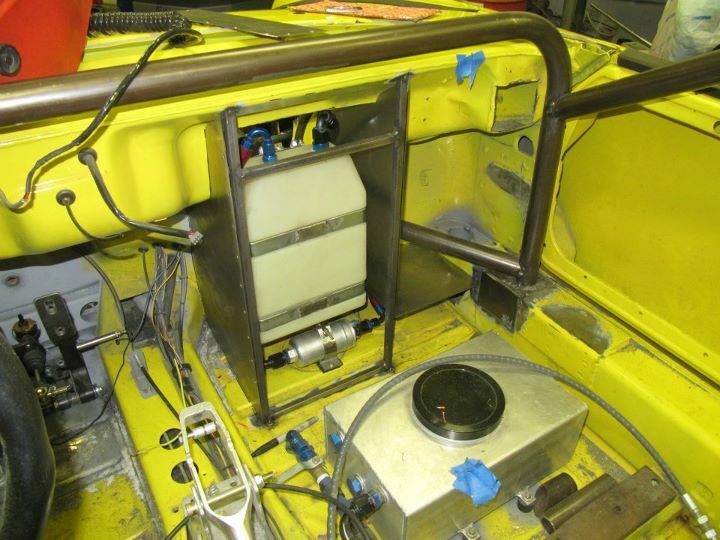 Due to lack of space in front trunk and the fact that I need to keep the fuel away from the hot radiator air, I move the fuel tank into the passenger compartment and built an enclosure since it must be fully sealed. 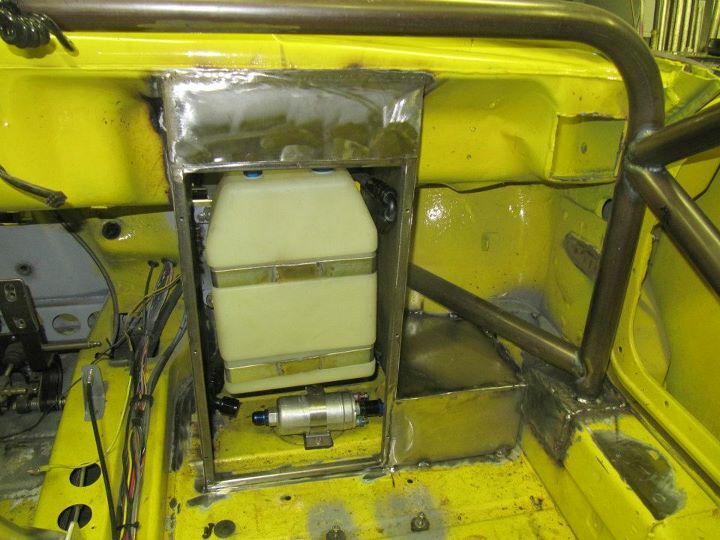 View of the enclosed fuel tank from the front trunk. 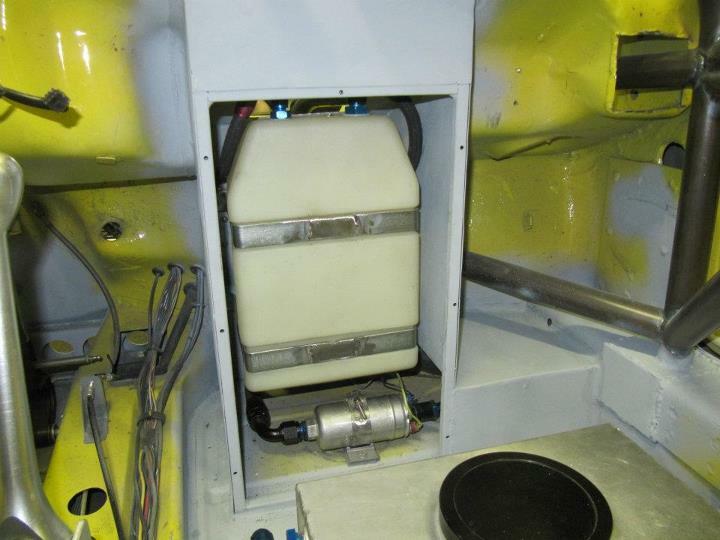 Another view of the fuel tank enclosure. 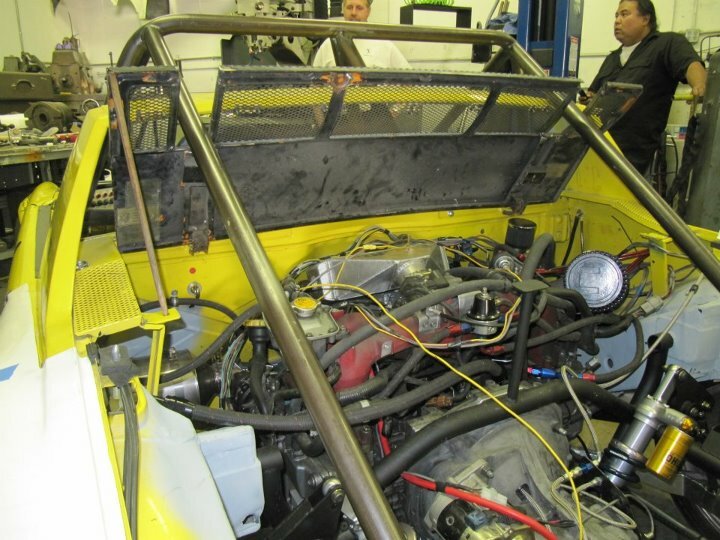 You can see that it is also enclosing the passenger side radiator line and just inside of the cage bar going to the front suspension. Fuel tank enclosure all welded up. 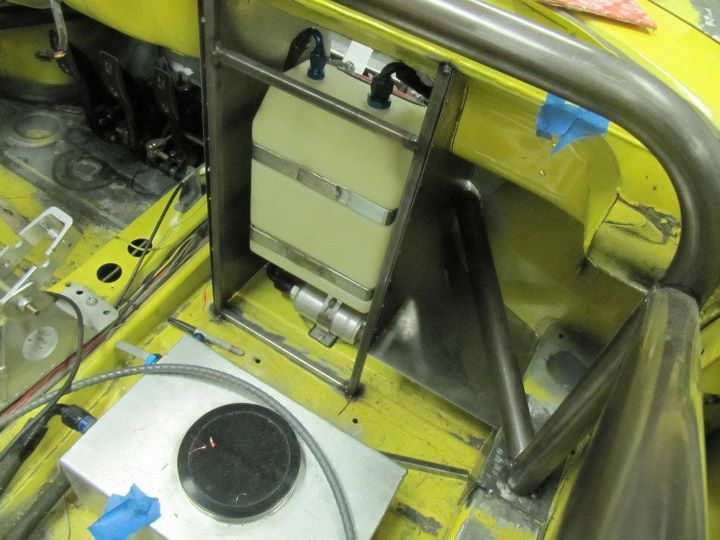 Fuel tank enclosure with the access door mounted. 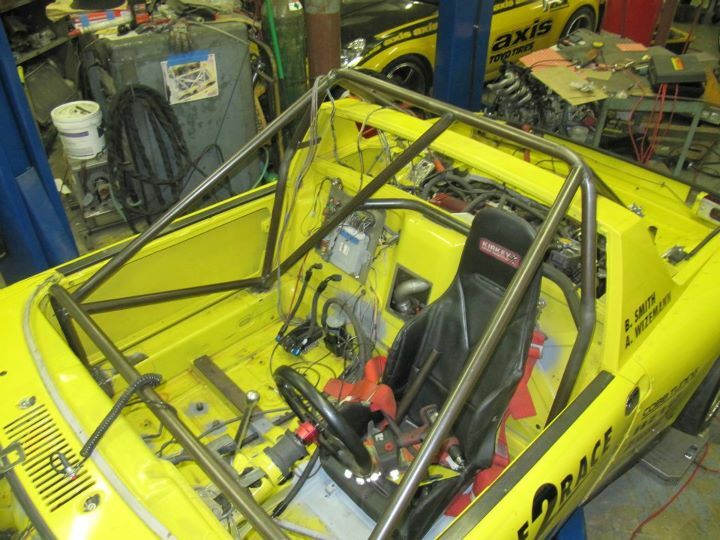 Most of the cage welded in. 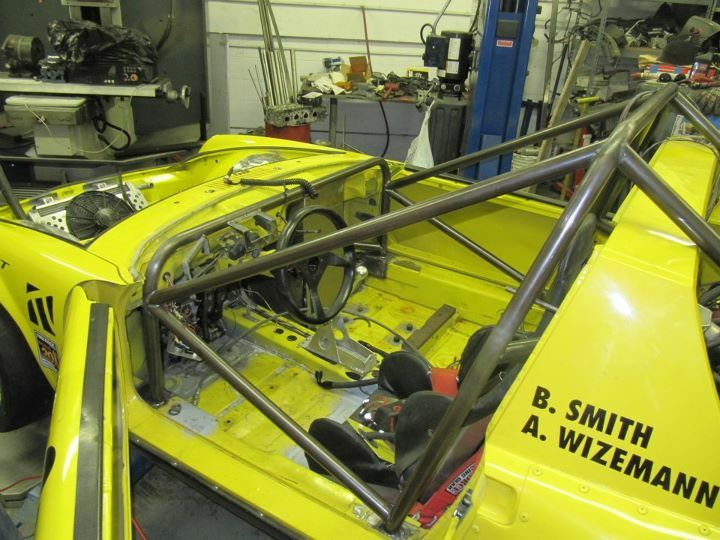 Still need to weld in the petty bar, the harness bar, and two bars to the top of the front suspension assembly. 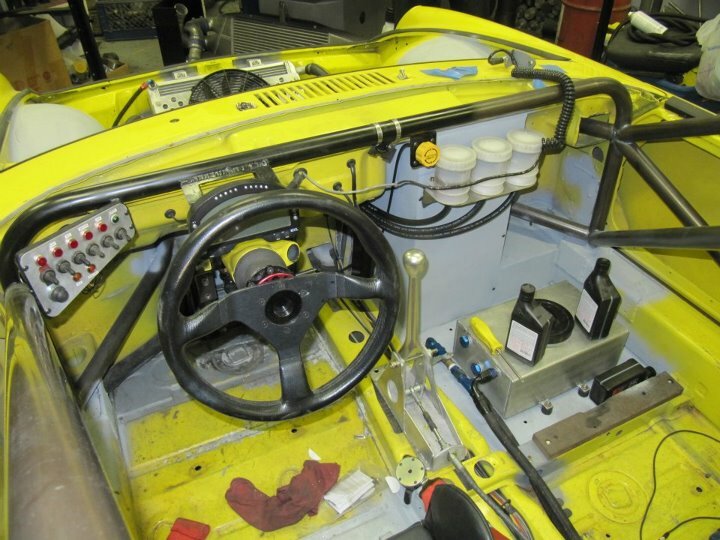 Another view of the cage and the kick-*** Rothsport Quick Disconnect for the steering wheel. 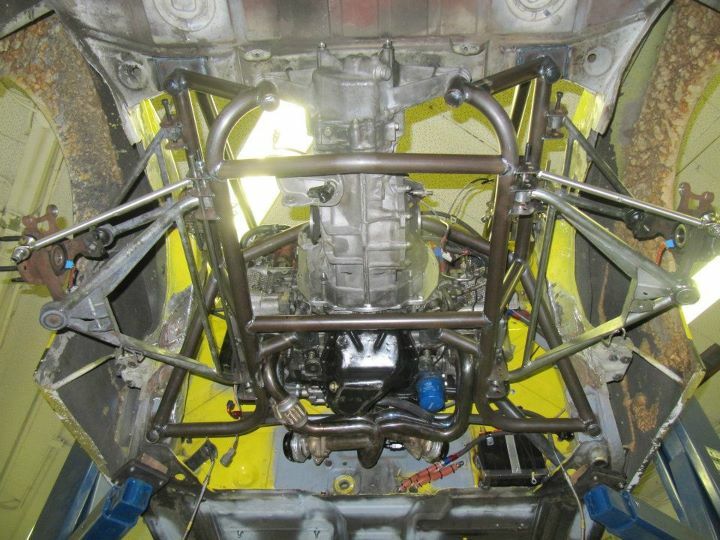 Front view of the cage and front suspension. 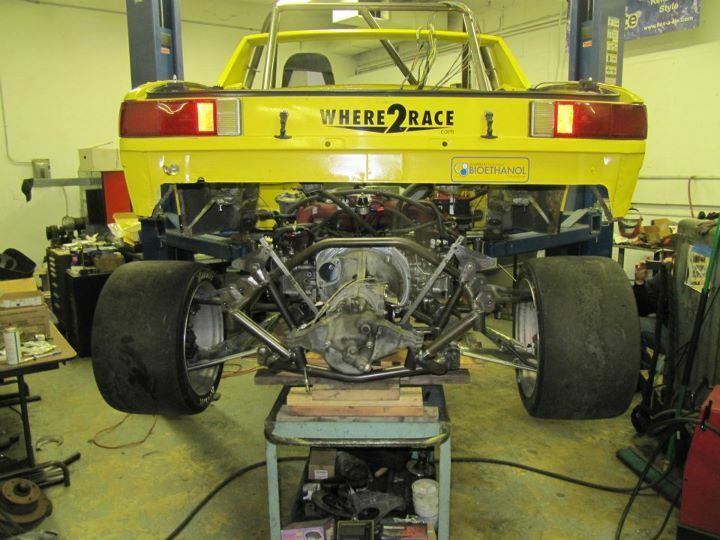 Front suspension installed with the steering rack in place. 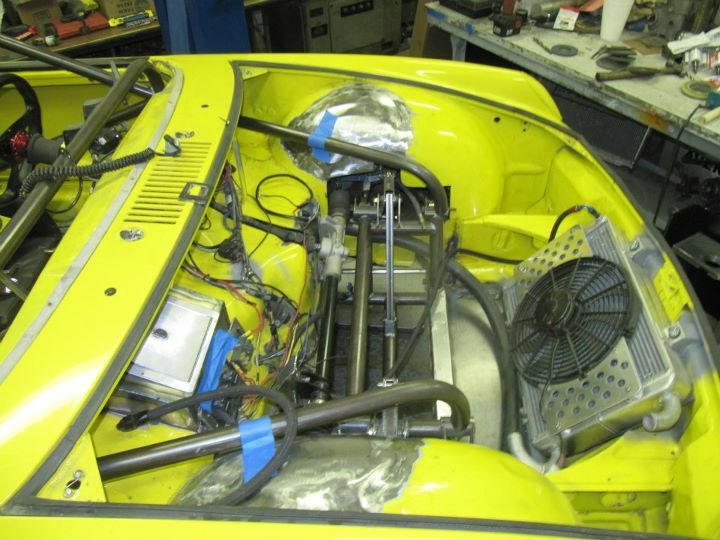 Need to decide where I am going to mount the electrical panel and tidy up the radiator lines. 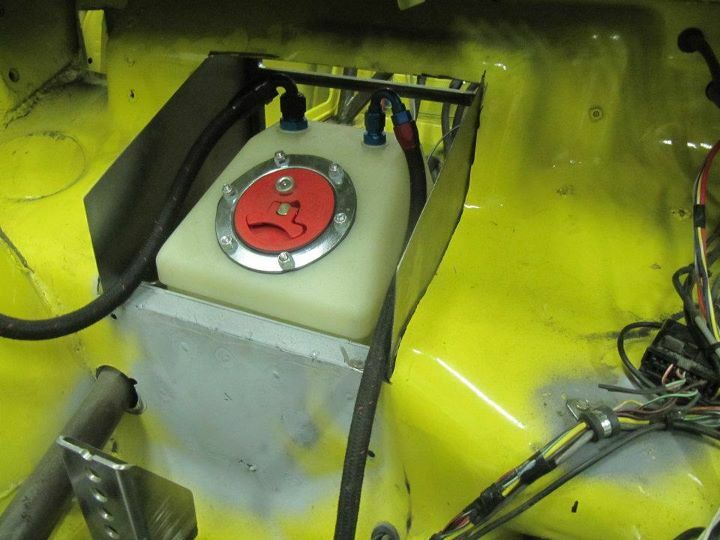 You can also see the fuel tank enclosure door in place. Side view of the front trunk. First iteration of exhaust routing. I don't have room to go backwards thru the suspension area so this seems to be the best route. 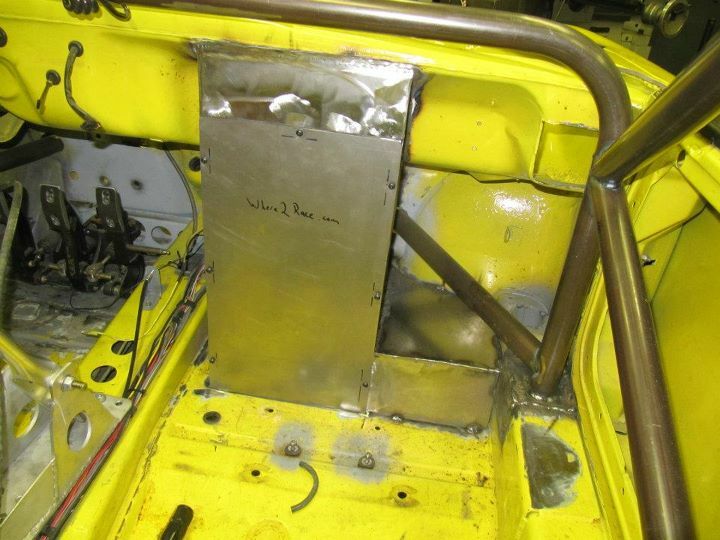 View of the exhaust routing with the water line in place. 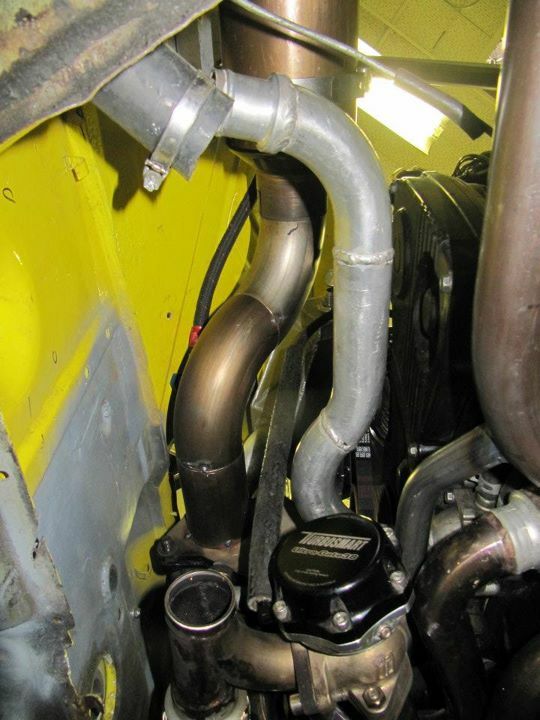 Still need to complete the wategate dump back into the exhaust stream. Exhaust routing into the fender well area. 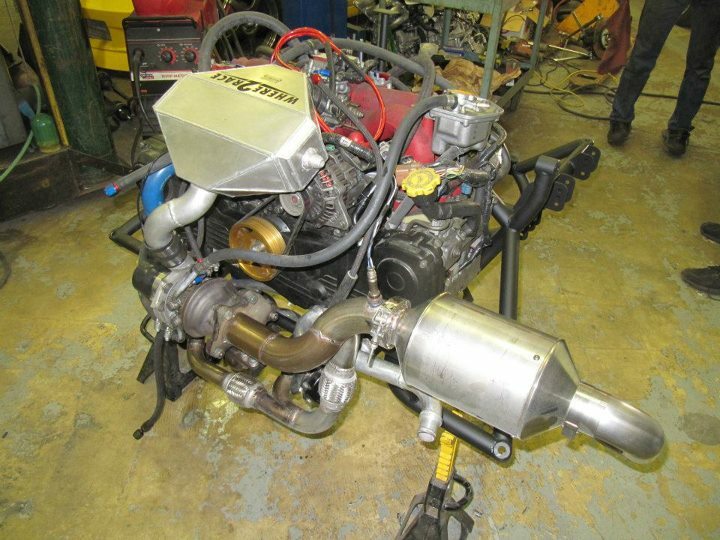 It will dump outside the fender and allow for additional mufflers to meet sound regulations. Top view of exhaust routing. Still a lot of work to get done, but progress has been steady and I can't wait to drive it. As always, looking great. Keep up the good work. 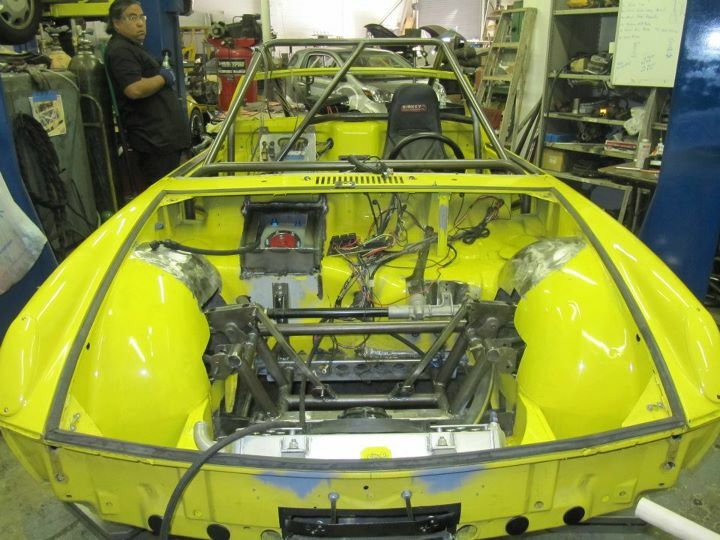 Some great updates as we get closer and closer to having the car on the track. 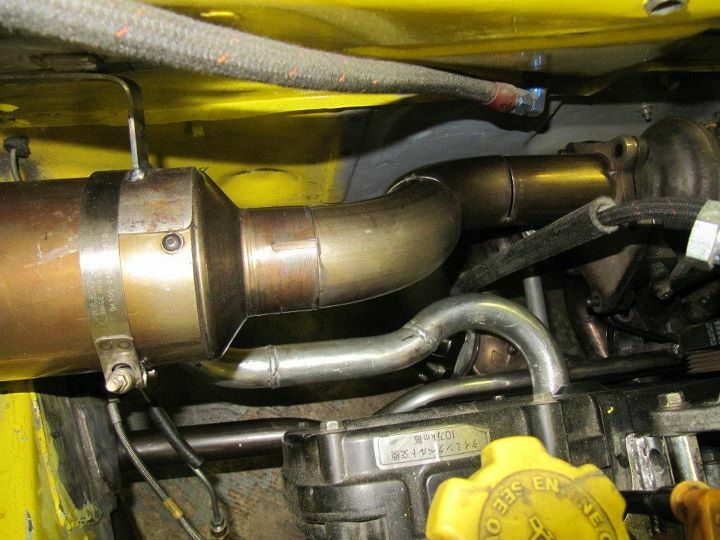 First up, exhaust. Since we ran out of room to route the exhaust out the back of the car, I had to modify the arrangement to allow it to be routed out the side of the engine bay. 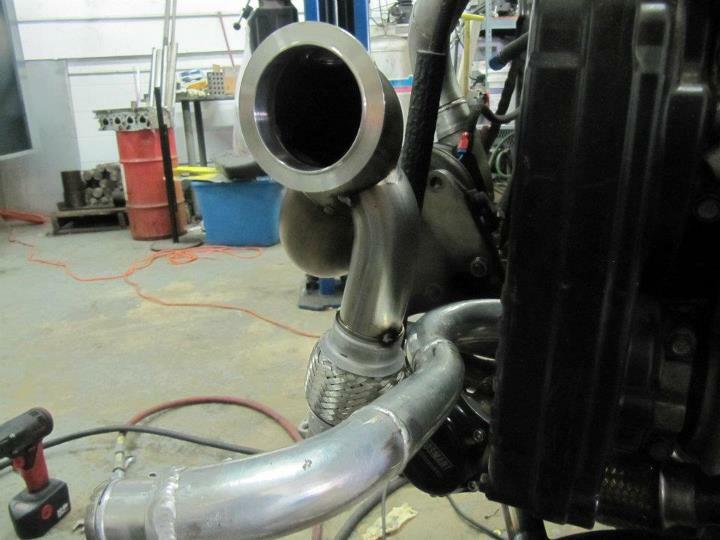 Here is the new wastegate plumbing completed. I added a second flex joint to make installation on the second wastegate a bit easier. Also got the nice V-Band for the muffler connection. 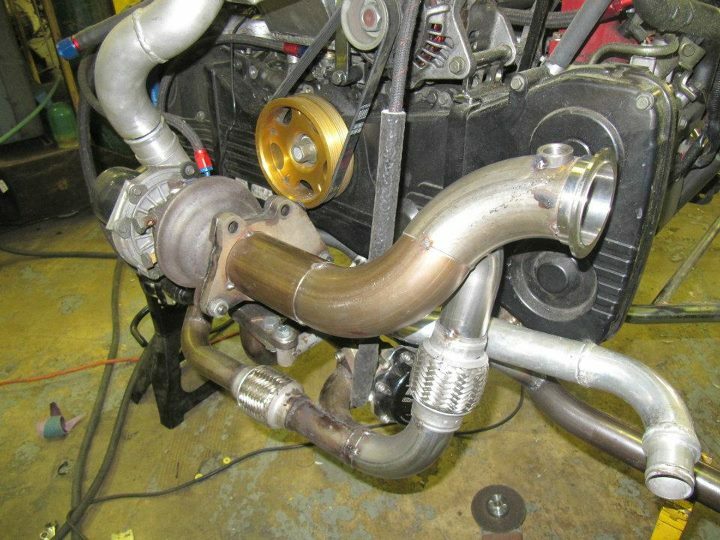 Another view of the wastegate plumbing. Getting the joints to line up took quite a bit of time. 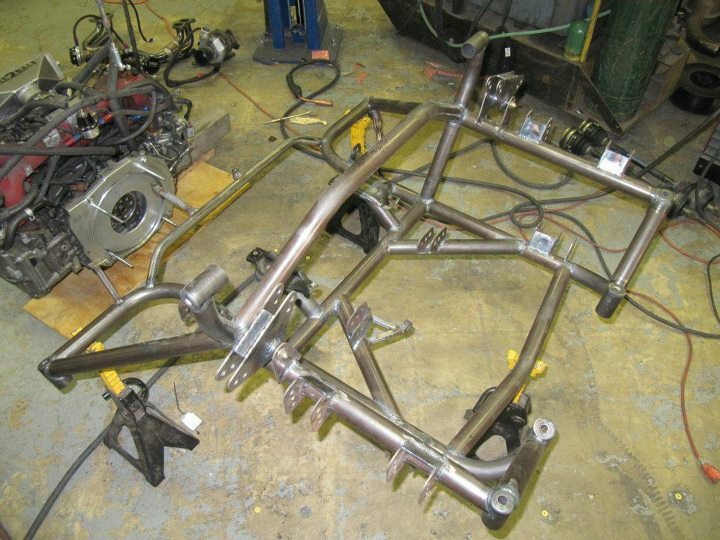 Here is the complete Sub-frame back out of the car ready for final welding, painting, and then reassembly. 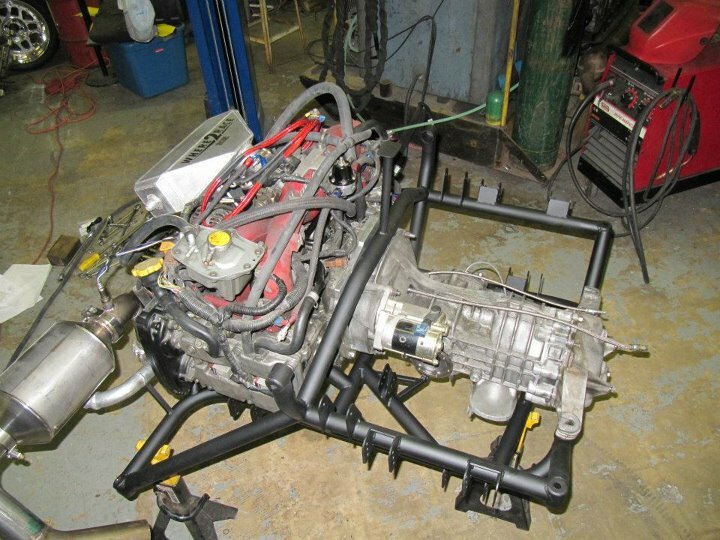 Engine and transmission reinstalled in the sub-frame. On to the interior...or ****pit I guess since there is not much interior. 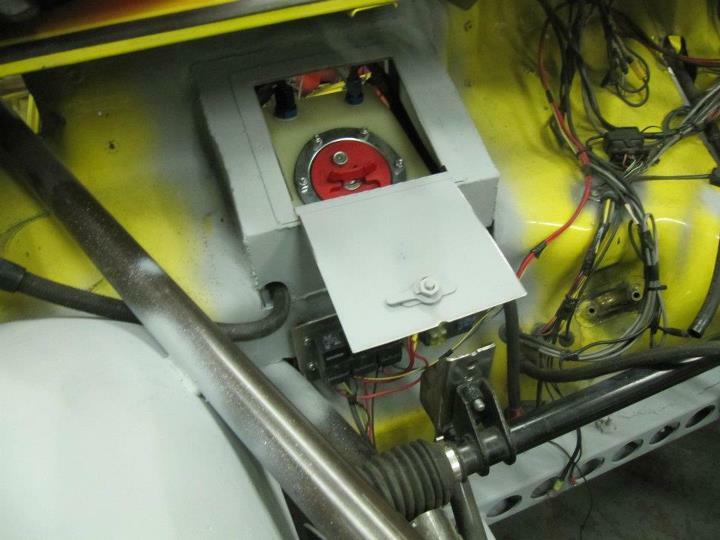 Fuel tank enclosure completed and tank/fuel pump mounted. View of the fuel tank enclosure from the front. Fuel tank enclosure door closed and tank seals from inside the car completely. 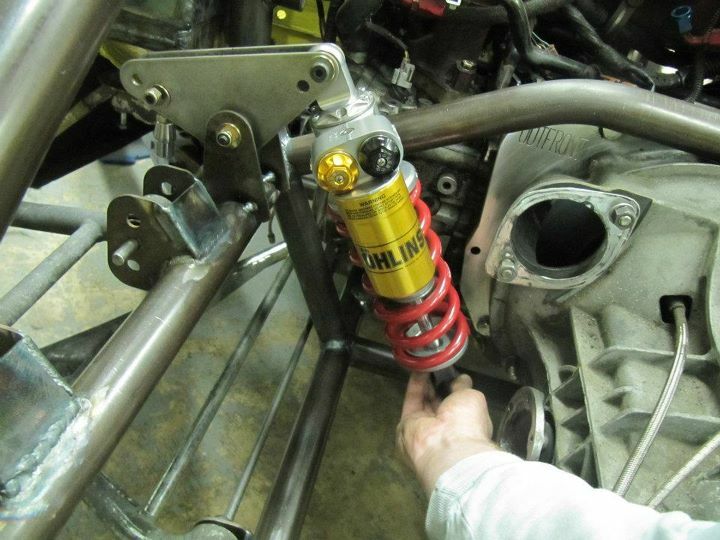 Got the custom set of Olhin shocks. 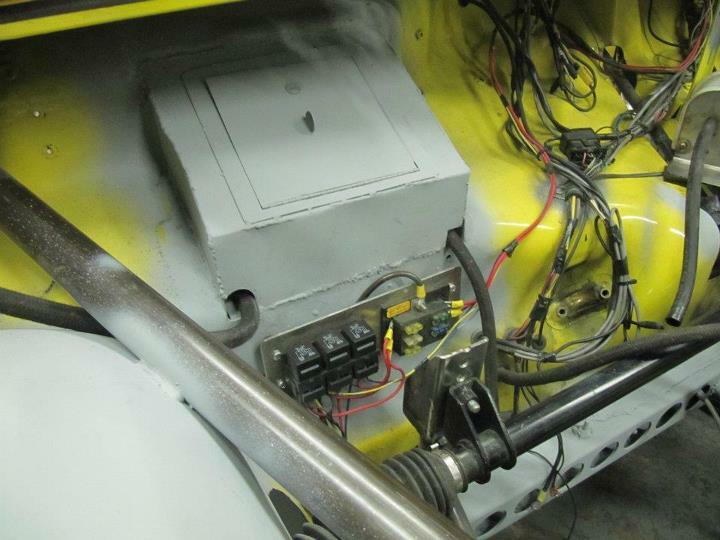 Front shocks installed on the inboard rockers. Close-up view of the front shocks installed. 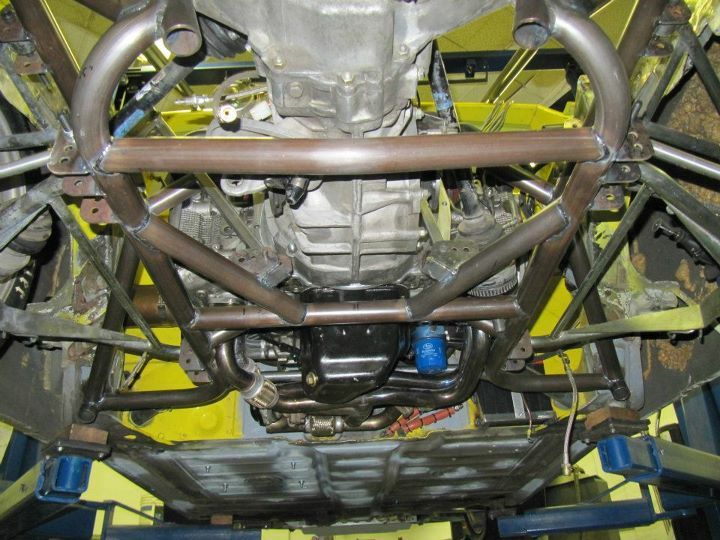 View from below of the rear shock and suspension. 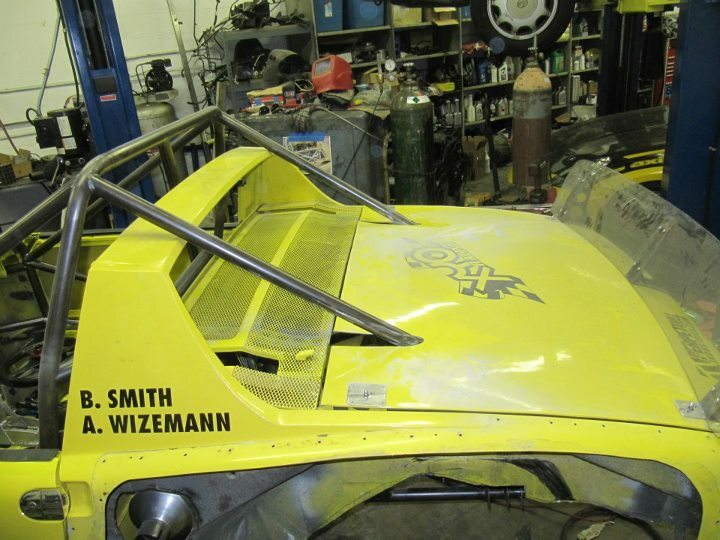 Clearance the rear trunk lid for the new cage bars. The holes are not as bad as I thought they would be. Master Welder Evan working his magic on the last few cage bars. As of now, all the major welding is completed. 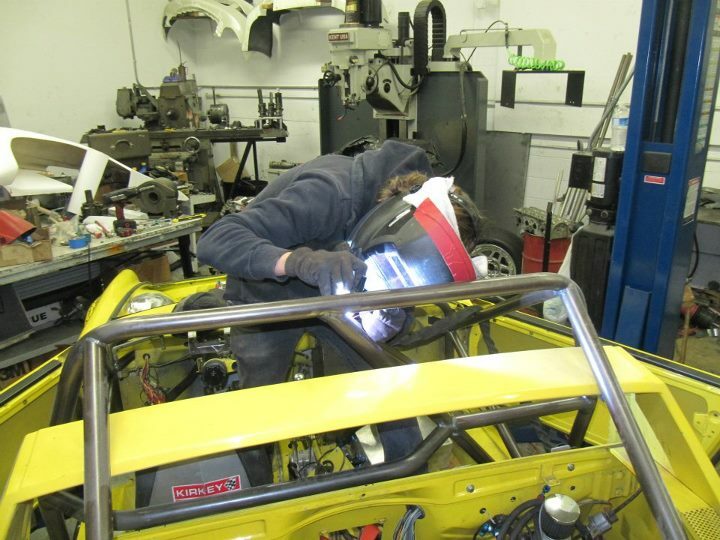 Due to the new position of the cage I had to find and modify another engine lid to clear the bars. 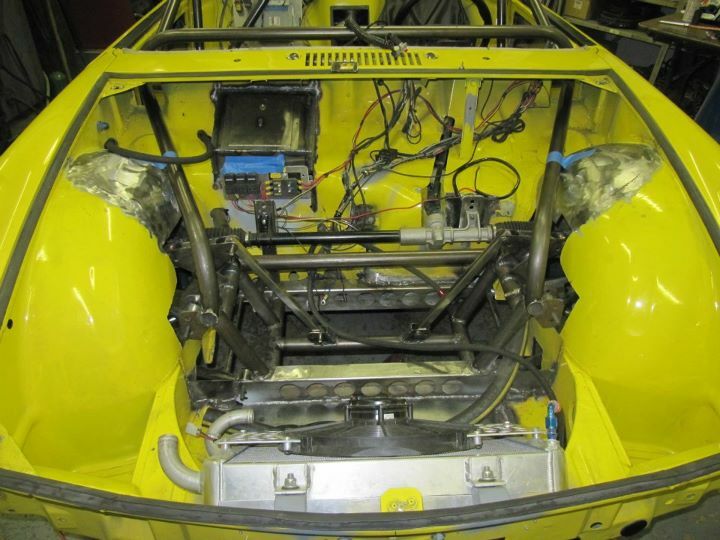 View of the modified engine lid in the up position. I previously mounted the vehicle speed sensor to the outside of the inboard CV, however this interfered with the springs. Therefore I had to weld it to the inside of the transmission output shaft and reverse the sensor mounting. 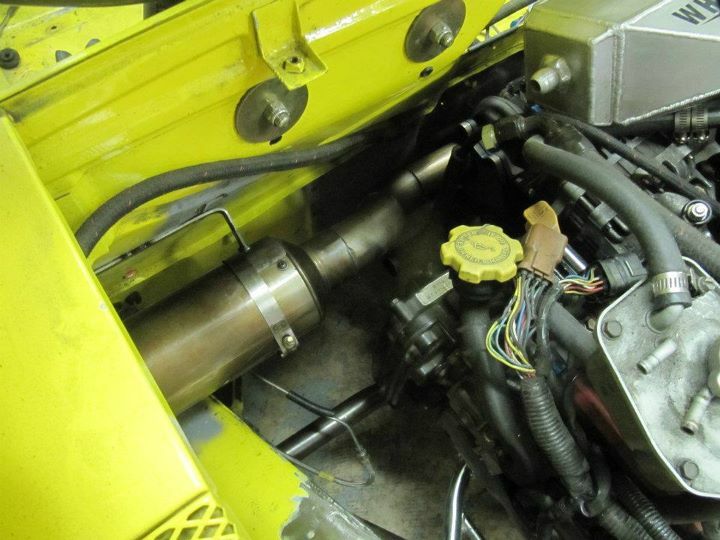 Also added a mount for the hydraulic clutch lines. New GT Racing rear flares installed. Might need some slight modification, but at least they clear the wide wheels. 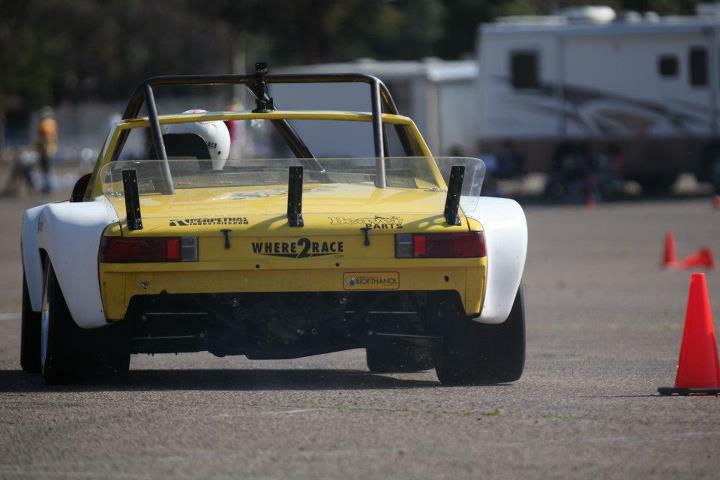 Back view of the car with the rear flares installed. Top view of the rear fender width. This is one of my favorite views....talk about wide! Can't wait to see video of this thing on the track! Dude how much fun is that car with a STi motor? 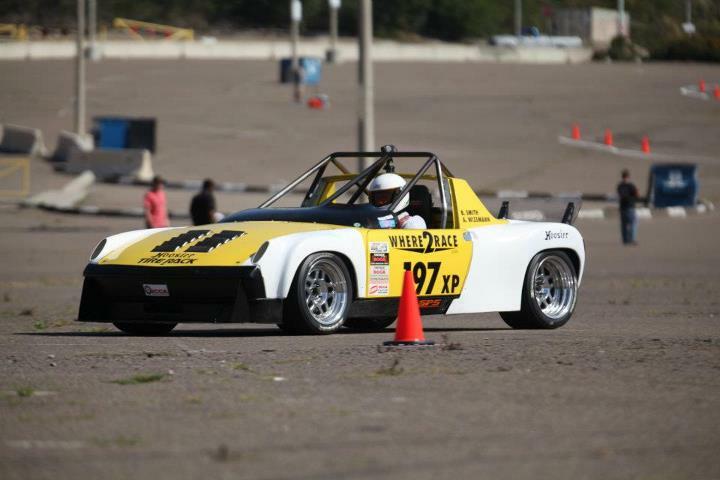 I didn't get to drive it yet, but the car successfully made it through a set of shake down runs at El Toro this past weekend. Still needs proper bodywork, ride height lowered, sway bar, new tires, proper brake pads, cage painted, replacement ball joint, and some spring changes...but it is getting closer. It has been a few weeks since I last posted, but in that time we have ran the car at the San Diego National Tour and the El Toro Pro Solo. Both weekend were not without issues, but we are getting much closer to completion. I will start out with the San Diego National Tour weekend. I arrive a day early to get everything sorted out on the car and ensure that it was ready. 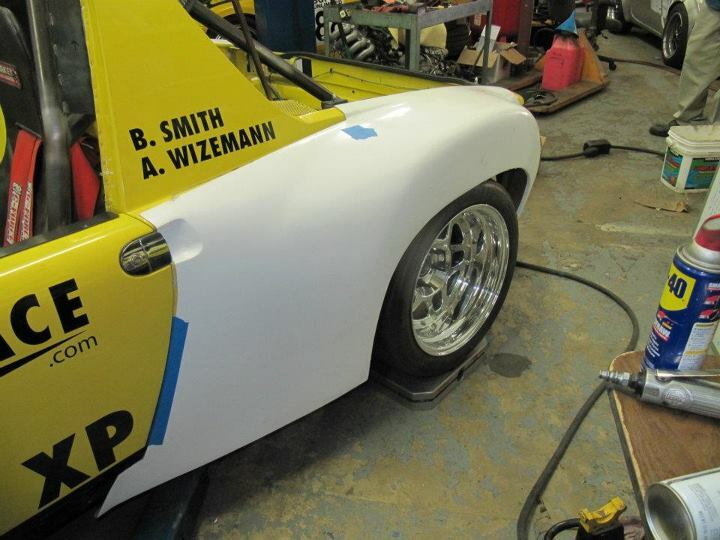 We spent quite a bit of time on the small stuff, including several hours to get the car corner weighed and aligned. There are just so many adjustments that it takes a while to get them all working together. Once we had everything completed, it was time to test drive it up and down the street in front of the shop and get it loaded up. Just as we were about to load it in the trailer, the transmission decided to grenade and no longer function. We pushed it into the shop and were able to pull out the transmission, rebuild it, and reinstalled in 1hr and 9mins....it ended up just snapping the arms off the slider hub and we upgraded to a later model 915 slider which is much thicker. With that fixed, we headed to San Diego. Since the shake down runs, we added a front blade adjustable sway bar, lower the spring rates, upgraded to racing brake pads, and put on the new tires. It was basically a new car at this point. We basically spent the entire event making set-up adjustments and reteaching our brain how to drive this think. It is odd to get into a car that you have been driving for so long and to break all those habits that it took to make the previous set-up work. Here are some pictures of the car in San Diego. The ride height is about 2.5inchs higher than optimal because the front wheels would hit the fender thru the turning arch. 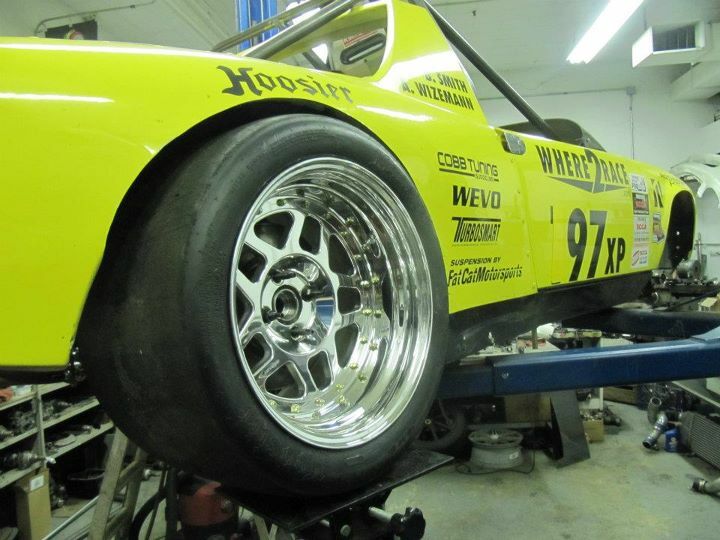 The set-up that I went with is QRS Fiberglass front fenders widened about 1.5" and GT-Racing Rear Fenders. 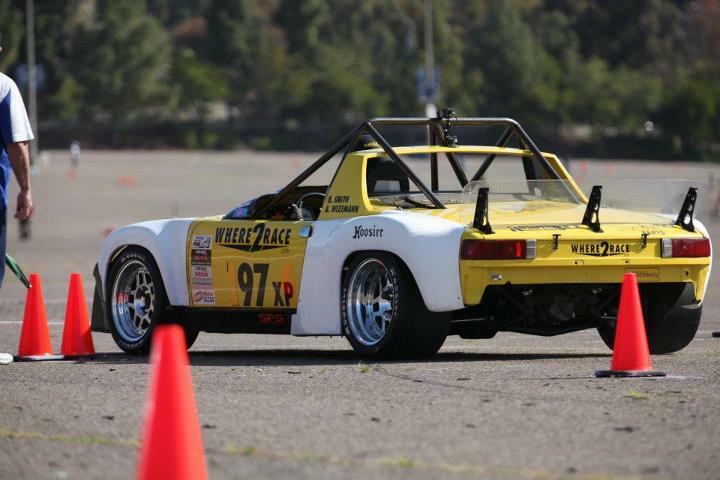 The next weekend I returned to So-Cal to run the El Toro Pro Solo. 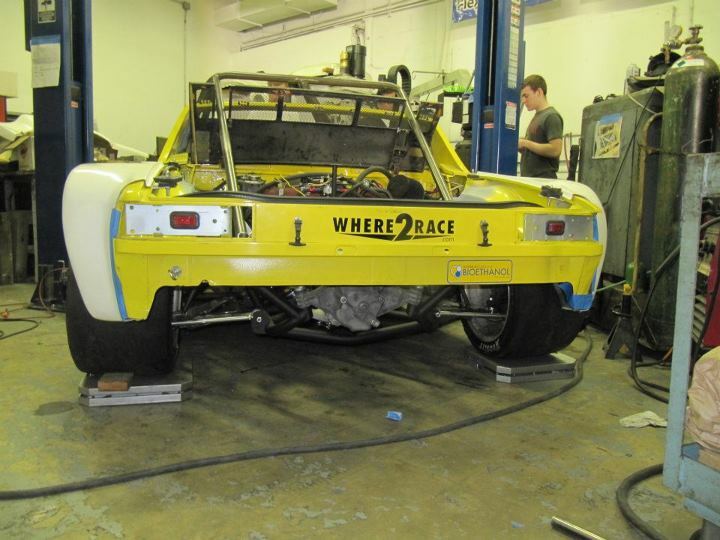 This time around we had time to cut the front fenders for more tire clearance and lower the car to the desired height. 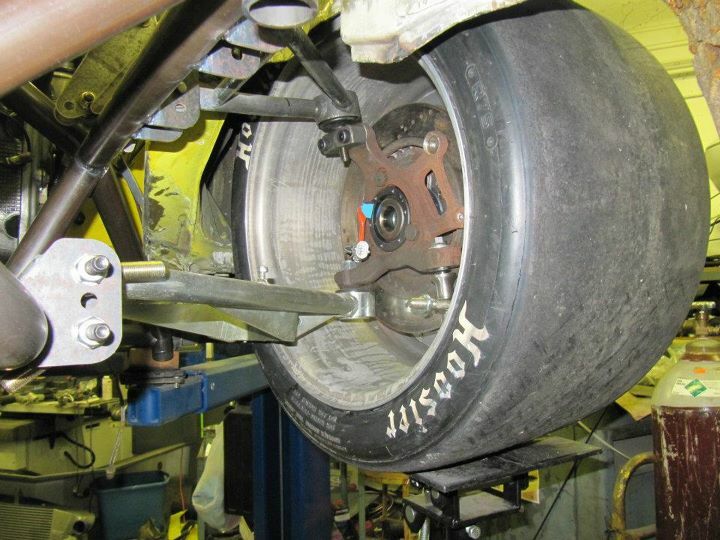 Unforeseen issues with this new ride height was that the front lower control arm was hitting the sway bar bracket under bump and therefore resulted in the car having basically "infinite" front spring rate. This explained the bad corner entry push and corner exit snap-oversteer that occurred the first day of the event. 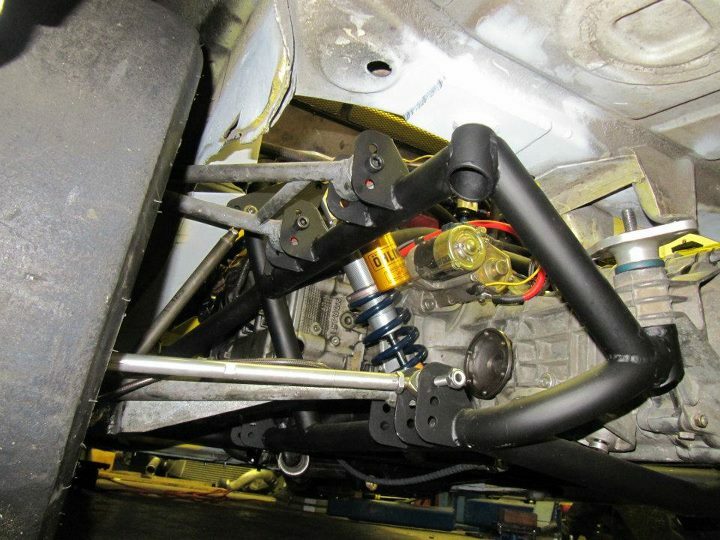 We returned to the shop to relocate the front sway bar to a higher location to gain the necessary clearance. 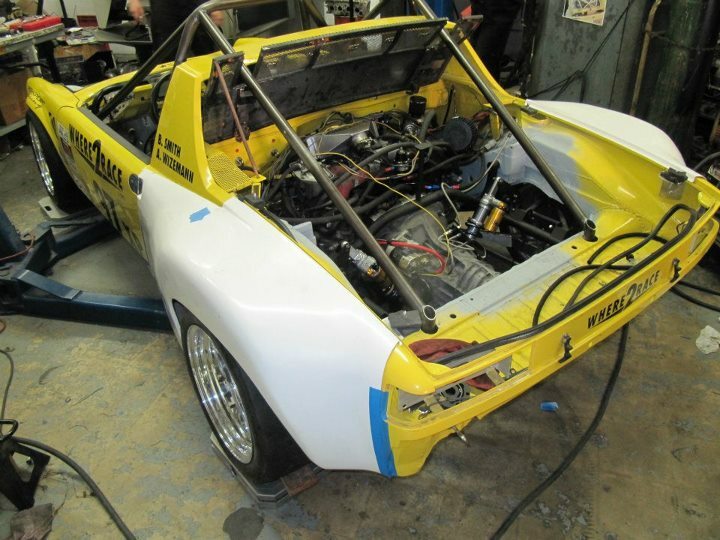 The car showed much improvement while running the next day. However, now under hard breaking on corner entry we had the splitter hitting the ground and the wheels rubbing the inside upper fender well due to the car sitting too low. This really cause the car to get upset on low-speed corner entry and greatly effected my run times. 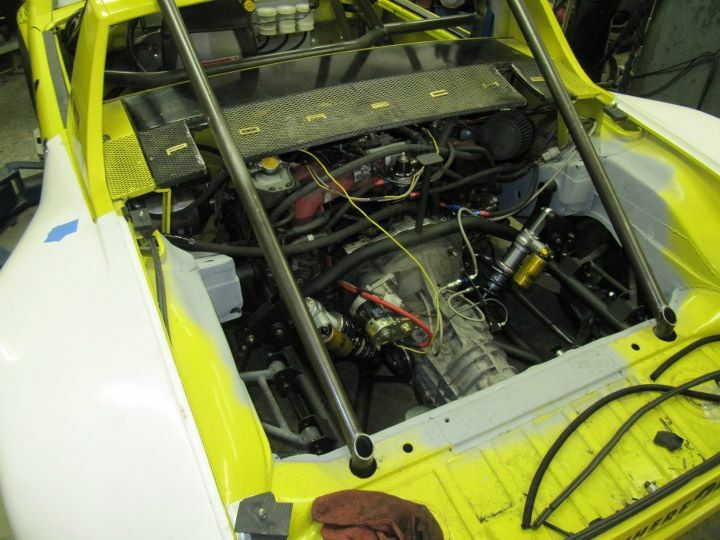 I have since raised the front end, reset the bump steer, set the toe and I am ready to go racing again this weekend for further development time. I will get some more pictures posted soon, I have spent most of my time underneath the car with dirty hands.